The 11th edition of the IPL is quickly approaching and fans cannot wait for the tournament to begin. IPL has everything from on-pitch action to blistering sixes and wickets falling. Sometimes, in the heat of the battle, when things get extra competitive, harsh words are exchanged. Some players often sledge their opponents in order to psych them out and gain an advantage. This kind of a situation is prevalent in all forms of cricket so eventually, it would reach the IPL. So here are the top moments of IPL sledging. In IPL 7, Mumbai was playing against Sunrisers Hyderabad and David Warner was at the crease and facing Zaheer Khan. During the 4th ball of the over, Warner hit a single and as Zak passed him, the Aussie raised a finger to his helmet in a shushing motion. Zaheer shot him a dirty look and in the final ball of the over, got his own back when Warner was only able to hit another single. The Sunrisers were at 141 with 2 wickets down at the time. Dale Steyn is not as effective as he used to be which possibly explains why he was not picked by any team this auction. However, back in his heyday, he was a lethal bowler. Back in IPL 7 again, the South African was up against KKR’s Yusuf Pathan. However, nobody told Yusuf about Steyn’s reputation, or he didn’t care. With 45 runs needed from 20 balls, SRH skipper Darren Sammy handed the ball to Dale Steyn. Theoretically, even if Steyn didn’t bag a wicket, he could still limit Kolkata in terms of runs, but Yusuf had other ideas. 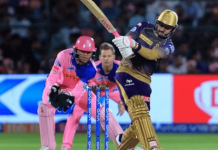 KKR put up 113 runs and Pathan smashed Steyn for a six. He gave himself a hand and so did Steyn. But when the latter limited KKR to a single run with a great delivery, Yusuf didn’t applaud. It was an odd IPL sledging moment but Yusuf got the job done. Sledging between opposing players is common but it is unheard of to sledge your teammate. 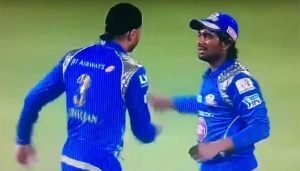 But in this IPL sledging incident, Harbhajan Singh was annoyed at teammate Ambati Rayudu. 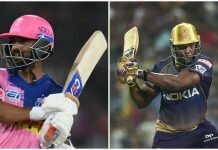 While playing against Rising Pune Supergiant, Saurabh Tiwary smacked the ball away but Rayudu got a hand to it. However, the ball slipped from his grasp and reached its destination. Bhajji was understandably furious but by the time the two walked up to each other, tempers had cooled down. The incident occurred in the 2013 edition when Kohli hooked a shot straight into Lakshmipathy Balaji’s hands. Instead of walking back to the dressing room, Kohli chose to storm towards KKR captain Gautam Gambhir. The latter did the same and were preparing for an altercation. Fortunately, Gauti’s teammate and fellow Delhi player Rajat Bhatia ran up and averted a disaster. 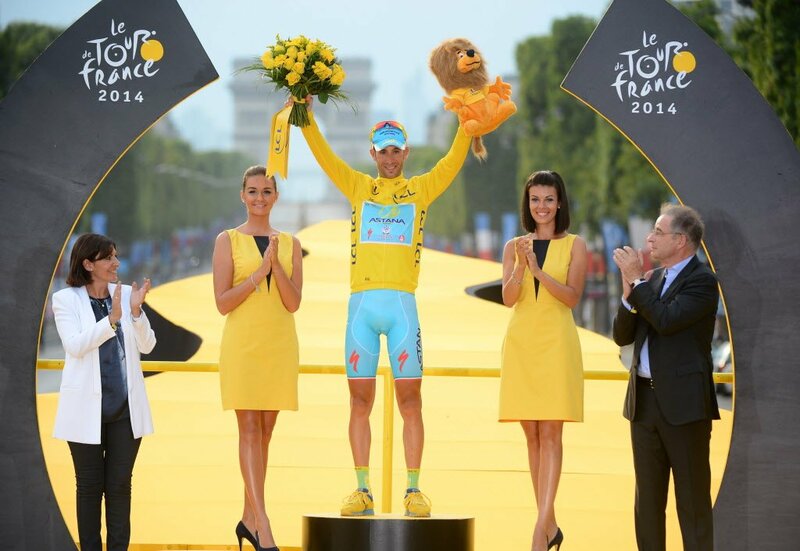 In the end, Kohli relented and began the long walk home. This was the true definition of an ugly scrap between two players. 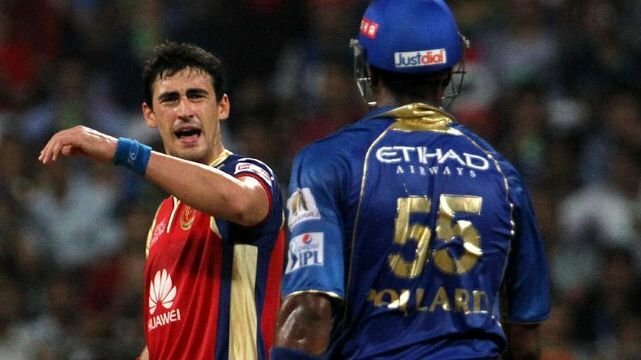 RCB’s Mitchell Starc was preparing his run up when batsman on strike, Kieron Pollard bailed out at the last second. But the whole incident started in the 17th over when Starc exchanged words with the West Indian. When Pollard bailed out, Starc kept going and bowled close to Pollard’s legs. As mist turned red, Pollard threatened to throw his bat and it slipped from his grasp. Starc got his revenge by running out Pollard. As he left, Starc gestured to him mockingly advising him to dive. The match officials were unimpressed with the stunts and fined both players.